The White House insists that VA Secretary David Shulkin resigned, disputing Shulkin’s own account of being fired. Shulkin did not submit a resignation letter and wasn’t allowed to return to his office after being told he was being replaced. The reason: firing Shulkin would have automatically made VA Deputy Secretary Thomas Bowman – with whom the White House has clashed over VA privatization– the VA’s acting secretary. Claiming that Shulkin resigned allowed the White House to hand pick the DoD’s Robert Wilkie as acting secretary. There’s a health IT aspect in play. If Wilkie signs the VA’s Cerner contract as acting secretary, it could be challenged on the grounds that he isn’t serving in his role legally. 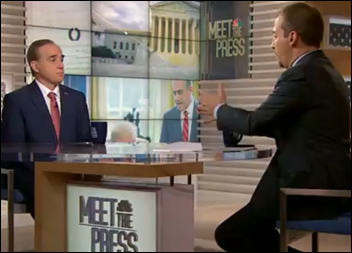 Shulkin said on Sunday’s “Meet the Press,” “I came to fight for our veterans and I had no intention of giving up. There would be no reason for me to resign. I made a commitment, I took an oath, and I was here to fight for our veterans.” He was emphatic in saying on another Sunday talk show that, “I did not resign,” adding that he was told in a telephone call from White House Chief of Staff John Kelly shortly before President Trump tweeted that he was nominating White House physician Rear Admiral Ronny Jackson, MD to replace him. The most common online sources used by poll respondents to find a doctor are their insurer’s provider list, Healthgrades, and Google Reviews (that last one was surprising to me), although “none of these” was the #1 answer. Commenters mentioned that most doctors have few reviews with relevant details, also noting that insurance company lists are outdated, fail to describe what types of patient that doctor sees, and are full of doctors unwilling to accept new patients. A reader suggests going the other direction – ask around for recommended doctors and then call them up to see if they accept your insurance. New poll to your right or here: what’s your most-valued use of LinkedIn, if any? My next question involves what you wish you’d known before serving on the board of a company or non-profit. I see quite a bit of the latter on LinkedIn profiles and I’m interested in how that works. Japan’s Panasonic Healthcare Holdings renames itself to PHC Holdings. 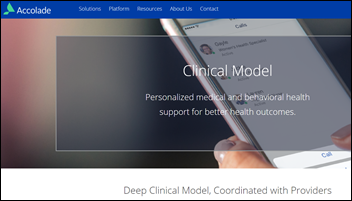 Personalized health and benefits solution vendor Accolade raises $50 million in a Series F funding round, increasing its total to $217 million. Consulting firm 314e hires Douglas Herr (Leidos Health) as SVP. California’s attorney general sues Sutter Health, claiming the health system violated antitrust laws in using its market dominance to force insurers to sign “all or nothing” contracts at inflated prices and to charge unreasonable out-of-network prices. UK’s General Medical Council investigates 30 doctors for unsafe online prescribing after several patients died after being ordered narcotics from online visits. A recent report found that online doctors prescribed opiates and antibiotics without performing due diligence and failed to notify the patient’s PCP in some cases. 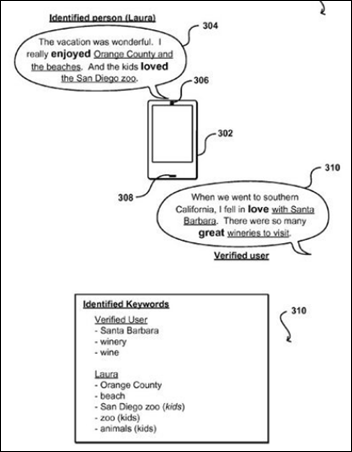 Patent filings from Amazon and Google suggest that their digital assistants could do a lot more than obey pre-programmed commands, suggesting their potential uses to monitor voice and telephone conversations to get ad-serving ideas for both parties involved and listen to body sounds to detect potential medical situations. Caregivers create a “portrait of the patient’s medical situation at the moment,” limited to a fix number of characters to force a concise recap similar to a tweet. The patient portrait is frequently updated under rules that also define who is responsible for doing so. The patient portrait is used as the patient’s “wall” whose updated information is used as clinician groupware. Data importing is limited to prevent chart bloat, with minute-by-minute comments automatically deleted a la Snapchat. Voice- and gesture-based interfaces should replace keyboards and mice, including voice-powered order entry and information recall. Order entry should provide clinicians with costs and risks. Patients should be able to enter their own information remotely. EHR value should be enhanced with artificial intelligence. Readmissions dropped by half after Intermountain Healthcare implemented its “Partners in Healing” program, which places family members on a patient’s care team to prepare them to provide post-discharge care. 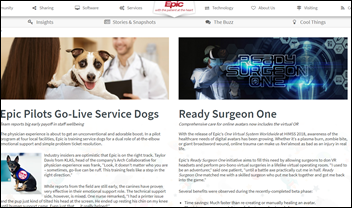 Epic did its usual home page makeover for April Fools’ Day (which I’ve spelled correctly). Vince and Elise continue their look at 2018’s largest vendors by revenue and digging deeper into Cerner, Epic, and Allscripts. Research and advisory firm SiriusDecisions recognizes Huron Consulting, Imprivata, and Vocera as winners of the 2018 Return on Integration Awards. WebPT becomes the first rehab therapy EHR to achieve Platinum Standard ISO Certification. WiserTogether and Myewellness partner to provide wellness solutions to employers and employees. April Fool’s, or April Fools’? “What I Wish I’d Known Before … Retiring or Career Downsizing.” Loving these! Thank you for the insightful feature addition.